Corporate tax cuts do no create jobs. It is important to understand this very simple, very obvious fact no matter what #alternativefacts you see. The Liberal government, and their owners in the CEO-union, the Business Council of Australia, are revving up a PR campaign to spread their lies, the likes of which we haven’t seen since billionaire miners stood on the back of utes wearing pearls, pretending like they’d met their workers before. And it’s up to us: you and me and everyone you talk to about this very fact, to refute this claim until we’re tired of refuting it, but we’ll keep going because it’s seriously important to all of us. Let’s make something clear. The Liberals and the Business Council know they are lying when they say tax cuts create jobs. That’s a given. But they have to come up with some excuse for this policy other than campaigning on a platform of more-yachts-for-CEOs. So they lie. When you think about it for more than a millisecond, it’s not hard to see why a tax cut puts more money in the pocket of business owners and executives, but certainly does not create more jobs. Nor do tax cuts increase wages. They could increase wages if employers chose to divert the money left over from paying less tax into higher wages. But that’s like saying a dog could break their bone in half and give the other half to the cat. Possibly, but never happens. 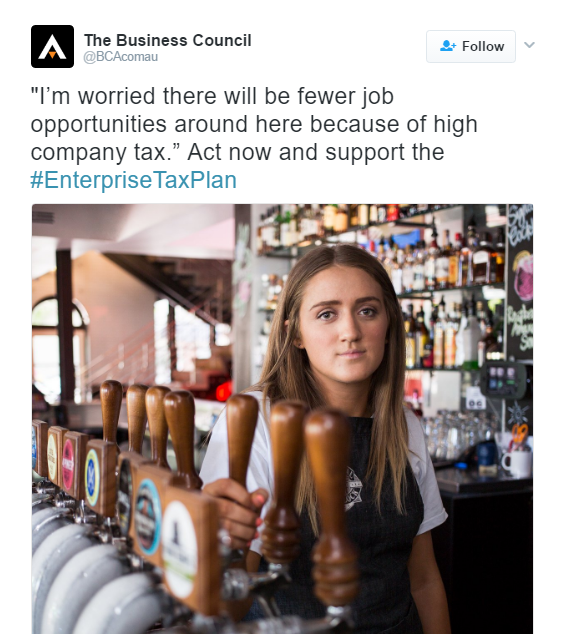 This young bartender, who incidentally is apparently working at The General Havelock in Adelaide, supposedly looks forlorn at the thought that there will be ‘fewer job opportunities around here because of high company tax’. I’ll give you a moment to compose yourself from laughing before reading on. In fact, Australia’s company tax rate is ‘not markedly out of line with the G7 countries’, but you already know the Liberals and the Business Council lie, so we’ll move on. Let’s assume the bartender is worried there will be fewer jobs in the bar because the owners of the bar have to pay too much tax. We’ll break this idea down. Hypothetically, let’s imagine the General Havelock owners get a 2.5% tax cut, as promised by the Liberals in their Enterprise Tax Plan. That means, at the end of each month, when their accountants add up how much revenue has come through the till from selling alcohol and food, and emptying tens of thousands of dollars out of their pokie machines, and then take out the costs, which include wages, they then have a look at their profit and take out 27.5% to give to the ATO, rather than the 30% they used to pay. The accountant says to the owner, ‘good news, you’ve got more to take home this month because less has gone to the tax man’. Now, I’m sure you can see this scene in your minds eye. You can see the accountant handing the owner the piece of paper to show the extra cash that is coming into the bank. How realistic is it to think this scene will choose-it’s-own-adventure down the path of the owner pocketing the extra cash and spending it on his own private consumption, such as a new luxury vehicle, another set of golf clubs, maybe put it towards a holiday home or an investment property. 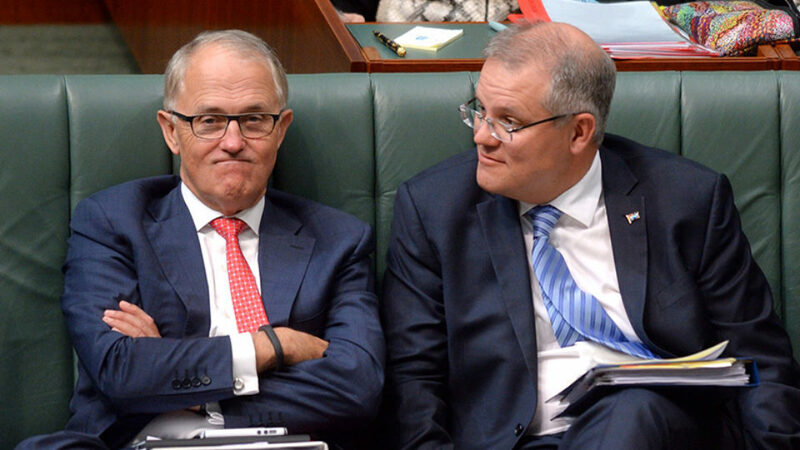 Or, will he turn to the accountant and say, ‘gee, I’m so pleased with this tax cut, I can now finally afford to hire two extra staff and grow my business’. Let that one settle for a second. Even in this strange parallel universe where the General Havelock owner puts his 2.5% tax cut into the pay checks for new staff members, in this la la land that doesn’t exist, think about it, why does he need those two extra staff members? Why, if his bar is already running smoothly, making him enough profit that he noticed a 2.5% tax cut, and there are enough people working behind the bar like this glum looking girl, pouring beers, and there are enough cooks in the kitchen, and security guards on the door, and staff to make sure the people in the pokie lounge never get tempted to go home, why if all that’s working fine, would a tax cut go into hiring more staff? And if there was a need for more staff, because there were more customers in the bar than the bar staff could possibly serve, why hasn’t the all-knowing business owner already hired more staff to meet this demand? Still not convinced? When was the last time you saw an ad for a bartender, maybe on Seek.com.au or on a little sign behind the bar, which said ‘bar tender job available, spending the tax-cut, enquire within’? You didn’t see this sign, because it never happened. What you do see, in reality, is the obvious reason for a job ad to exist: ‘bar tender job available, enquire within’ and when you enquire within, the job is available because a) there are too many customers (demand) and not enough people to serve them in order to make profit for the business, or b) the bar tender who used to do the job no longer does. This is the reality for a reason. Because CORPORATE TAX CUTS DO NOT CREATE JOBS. Say it with me. Thinking otherwise is either a massive misunderstanding about the fundamental relationship between worker, boss, profit and tax, OR is a bald-face lie. So which do you think the Liberals and the Business Council will more likely own up to? The perfect rebuttal of the four-decades-old lie of trickle-down.